As if From Dust PC didn’t already have enough problems thanks to Ubisoft DRM, gamers are calling the PC game another bad port from consoles. From Dust for the PC finds itself stuck at 30 fps, without anti-aliasing, and without vertical sync. The good news is that you can solve 2 of those 3 problems if you are an Nvidia card user. In this article I will show you how to force anti-aliasing in From Dust using the Nvidia Control Panel. 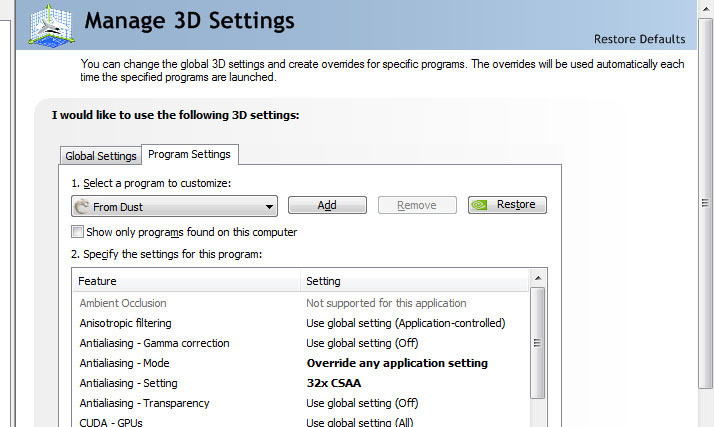 The Nvidia drivers 280.26, released on August 9th, 2011, now have a profile built in for From Dust. You no longer need to use Nvidia Inspector to get anti-aliasing. If you were curious, it uses a new AA flag 0x00483245. You will now have anti-aliasing enabled. You can fiddle with transparency options, anisotropic filtering, etc. if you want to. You can also reset the values later to defaults if you don’t like the look of things. While this method isn’t as good as native anti-aliasing, it’s better than nothing. You may notice that it causes some objects to appear to have a faint black line around it like it was a cartoon or cel-shaded animation. Good luck!